Hezbollah leader claims Israel tried to prevent Syrian army from achieving ballistic capabilities. 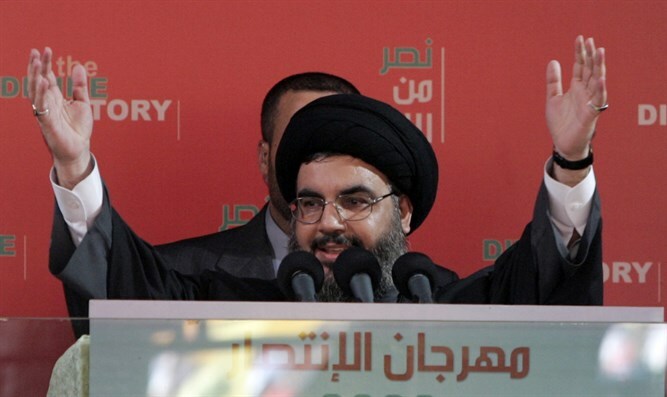 Hezbollah leader Hassan Nasrallah claimed on Wednesday that Israel has attacked Syria in recent days to prevent its army from achieving ballistic capabilities that will change the balance of deterrence between the two countries. "Israel lies when it says that the purpose of the attack was weapons intended for Hezbollah," Nasrallah declared. "The Israeli aggression in Syria is intolerable and must be stopped immediately." He added that the main problem in Syria was the involvement of the US in the civil war there. "The real enemy of the Middle East is the Americans and their policies. Even Israel is only an actor in the US play,” said Nasrallah. The Hezbollah leader also said that the terrorist organization under his leadership does not intend to leave Syria for the foreseeable future and will remain in the country as long as the Assad regime asks it to remain there. His comments followed this week’s incident in which a Russian plane was downed over Syria when it was accidentally hit by Syrian anti-aircraft fire during an Israeli missile strike. Hezbollah is a vital ally of the Assad regime in Syria, having sent its terrorists to fight alongside Syrian troops and sustaining heavy losses along the way. The group, which is Iran’s proxy in Lebanon, has received weapons from both Syria and Iran, which is suspected of having smuggled arms into Lebanon using civilian planes.